They say age is all in the mind, but for those of us who have celebrated a half-century or more, we know the body doesn’t always agree. 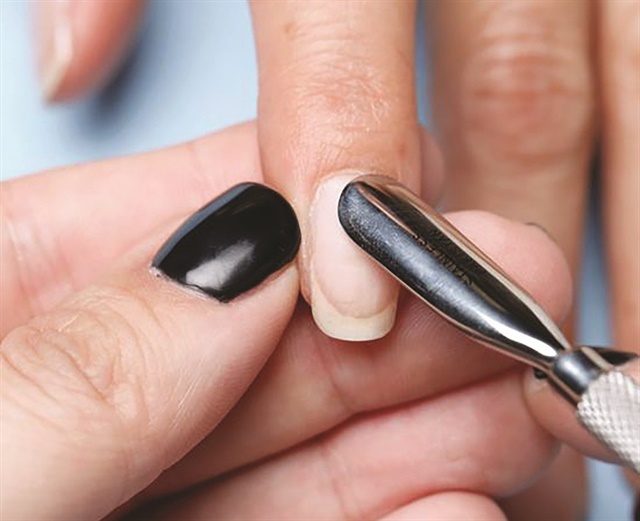 How does a nail tech cope with the physical changes when the body starts complaining about getting older? 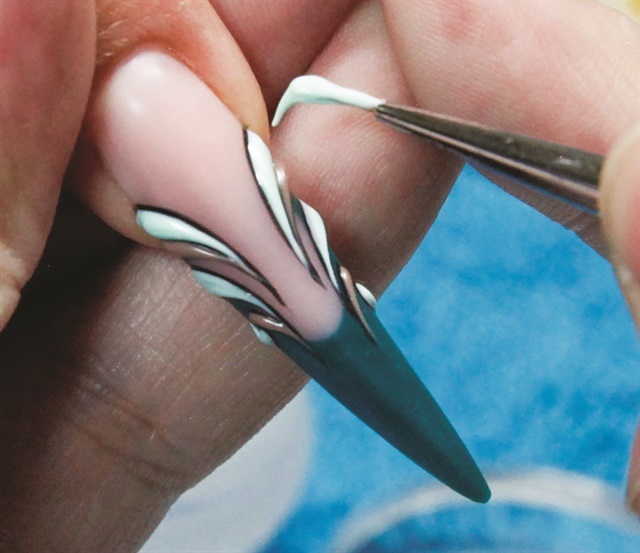 Even the youngest among us can feel the aches and pains that go along with working as a nail tech. Sitting all day, plus twisting and turning and bending over, can leave anyone — young or old — sore and stiff. Earlier in our careers, our youth compensated for long hours and negligence, and we could recover with a day off. But what do we do now that age compounds the pain, and we can’t afford the recovery days we need? They say the best time to start taking care of your body is the day you are born; the second best time is right now. And at this stage, it’s going to take intention. We asked the professionals to give us their advice on how to deal with physical changes we’re all likely to experience as we age. Here’s what’s happening: When light hits our eye, it refracts twice before it hits the retina and we recognize an object. The first curve happens at the cornea; the second at our lens. When those two curves refract the light correctly, we see clearly. Most of us make those manual adjustments by reaching for a pair of “cheaters.” The problem, says Dr. Ogawa, is we often choose readers that are too weak or too strong for our eyes. Instead of self-diagnosis, she recommends scheduling an appointment with an eye doctor. The doctor will check the health of the eye to rule out diseases common to age, such as glaucoma, cataracts, or retinal disease. Once those are ruled out, she’ll focus on the clarity of your vision. View the appointment with your doctor as a consultation and explain the demands of your job. “It’s critical to understand my clients’ work space and hobbies to get a full understanding of their visual needs,” says Dr. Ogawa. Her patients have told her they’ve had fewer headaches and less eye strain after she changed their prescriptions for their work environment. Her nearsighted patients with presbyopia, who spend hours a day focused on up-close detail or a computer screen, have benefited from a reduced prescription, adjusted specifically for their work. Talk with your doctor about options beyond readers or bifocals, such as an entirely different prescription to use while working. Depending on the stage of your presbyopia, this could make a big difference not only in your sight, but in eye strain, headaches, and even energy levels. Here’s what’s happening: Our joints move well when we have healthy cartilage and connective tissue, along with a good production of synovial fluid. These three factors work together to reduce friction on the joint and keep things “well oiled.” However, as we age, our cartilage experiences general wear and tear and the production of synovial fluid is reduced, so our joints become stiff and inflamed. Along with general wear and tear, we hasten the effects of arthritis when we hold our joints in the same position for long periods of time. “So for example, it puts prolonged pressure on the joints if your fingers are bent all day or if you sit for hours,” says Kimberly Kurtz, a physical therapist at Wake Forest Baptist Medical Center in Winston-Salem, N.C. “Movement is very important to relieve symptoms of arthritis,” she says. “Improving the strength and mobility of the muscles surrounding joints with arthritis will also help. Strong muscles will add support and decrease stress to the joint,” explains Kurtz. 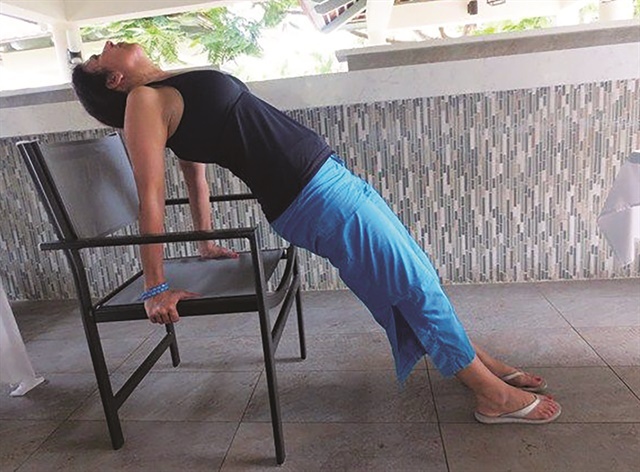 An arthritic joint with compromised cartilage and insufficient synovial fluid will still not move as it should, “but simple strengthening and mobility work can help improve mechanics to decrease pain,” she says. Lift your right arm straight out in front of you from the shoulder, with the elbow straight. With fingers pointing up, use the opposite hand to gently push the fingers back toward the body. Hold 30 seconds. Now, point the fingers to the floor. Again, use the opposite hand to push the hand toward the body. Hold 30 seconds. Repeat on the other arm. Beyond moving the joints in the wrist, this exercise stretches the muscles on the top and bottom of the forearm. Dr. David Martin, a chiropractor at Precision Chiropractic in Durham, N.C., recommends rapid, dynamic movements to help the joints; for example, squeezing an exercise ball in your hands for a few minutes when clients get up to wash their hands. Dr. Martin also recommends supplements that both reduce inflammation and build the specific cells in the cartilage that make the synovial fluid. These supplements, glucosamine, chondroitin, and caprylic acid, provide the body with the nutrients that promote healthy cartilage in the hands, wrists, fingers, back, and neck. Dr. Martin advises choosing a glucosamine chondroitin supplement that has an organic form of the sulfate MSM. A couple of caveats: Supplements do not work like pain pills. They need to be taken regularly over a long period of time to have any effect. Think of them as essential daily nutrition rather than pills to address symptoms. Additionally, the quality of the supplement is crucial. Do research to find a professional in your area, such as an herbalist, naturopathic doctor, or even a chiropractor who offers nutrition services. If you’re at work and your arthritis has flared up, try a topical anti-inflammatory that can help reduce your pain. Opt for one without the pungent smells associated with traditional analgesics, such as arnica gel or a cream with full-spectrum CBD oil. Though we talk about turning back the clock with a healthy lifestyle that includes diet and exercise, what we are really doing is trying to maintain mobility, health, and vitality for as long as possible. This is more important than ever as we age. Rotate these routines into those blocks of time so you keep your movements varied. For example, add 10 minutes of stretching to a block of time you’ve scheduled first thing in the morning — the minute your feet hit the floor. Follow a five-minute YouTube video on range of motion during one of the breaks you penciled in at work. Have a list of mobility exercises you can perform between clients to keep your joints lubricated and your body moving. Next, evaluate your work space for proper ergonomics. Reduce strain and stress by changing the height of your chair or the position of your clients’ hands and feet during services. Be aware of your posture, noting how your back curves, your shoulders hunch, or your neck strains forward and down. Then perform exercises that are the opposite movement, such as spreading your arms wide to open the chest and lifting the chin to the ceiling. Stand up and walk around. Do a few squats and lunges during the day. In other words, keep moving! It may also help to pad your schedule with longer appointment times. It’s normal to slow down the hectic pace you held when you were younger. There’s no shame, and a lot of benefit, to extending the service times to allow for a more realistic pace. 1. Use wider or heavier tools, which might help both with eye/hand coordination and with shaking. It may seem counterintuitive to add weight at a time when you think your strength is reduced, but you might find the counterbalance makes them easier to handle, and you don’t become as stressed trying to focus. 2. Reduce your intake of stimulants, such as chocolate and caffeine, which can cause shaking and increase nervous anxiety. 3. Increase the amount of water you drink. Dehydration can cause headaches, muscle cramps, and dizziness, which could account for the feeling of being irritated, exhausted, and light-headed.